Venice Self Storage at 658 Venice Blvd. Located near the intersection of Venice Blvd. and Abbot Kinney Blvd., Extra Space Storage serves residents of Venice, Oakwood, Marina del Rey, Culver West, and Mar Vista. Locals will recognize our facility next to Madd Dogg Athletics across the street from Vice Media and Erewhon Market. We're also accessible for residents of nearby apartments, such as Abbot Lofts, Moss & Company, Altair Apartments, Space B, Windward Village Apartments, Washington Apartments, and Admiralty Apartments. 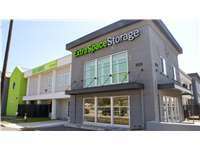 With a large selection of storage units, vehicle storage, and exceptional security, Extra Space Storage on Venice Blvd. is the self storage solution you're looking for in Venice. Our Venice Blvd. storage facility has storage units as small as 3x3 and as large as 10x30. Units also come with features like first-floor access, elevator access, reduced height, and outdoor vehicle parking. Need to store a vehicle in Venice? Extra Space Storage offers 8x20 outdoor parking spaces that can accommodate cars, motorcycles, boats, and RVs. Our Venice Blvd. location has meeting space available for rent. Host your business or civic meeting in the same facility where you store your belongings! We're dedicated to providing secure storage for our customers. That's why our Venice Blvd. storage facility has 24-hour video surveillance, an on-site resident manager, individually-alarmed units, and electronic gate access with personalized entry codes. At Extra Space Storage on Venice Blvd., we care about providing a great experience for our customers. That's why our facility is always clean, secure, and well-maintained, and our friendly, professional staff is dedicated to helping you get the best self storage solution for your needs. Contact us today to reserve a storage unit in Venice! Really liked my rental space and easy access as well as easy parking. The customer service provided was helpful and made me feel better renting space. Such a great experience, super easy and fast, especially loved how clean the storage facility was. Truly amazing. I feel comfortable leaving all my precious belongings there, especially with all the security features. Every person I dealt with regarding my ultimate rental of the unit were succinct, knowledgeable, warm & friendly. I was able to take care of the rental from another location because I was unable to get to specific location in a timely fashion. this was most helpful. Clean, secure, with excellent access hours. Very helpful staff, very clean and organized properly. It is very safe with different code entries. You need to buy their own lock for the storage which is about 18 dollars. The first month was free. I will definitely come back if needed. Great place to do business with! Store your business items and keep it nearby your establishment. They provide convenient access hours and storage doors with two options were you can bring your own master lock or they can install a lock that slides in the door and can not be cut with bolt cutters! I know the storage unit is supposed to be clean, it's the people here that make this place stand out. I actually stopped at several locations in my area and found all the agents friendly and really helpful (not so uptight like places I've had in the past!) Check in was fairly easy, move in was great, and the premises are always clean. They made move out easy as well.... Unlike those other places the feeling was always friendly. Tell Ricky I sent you! And if it's his day off - you're still going to be in good hands! Price was a little high except considering the area. Site manager was wholly helpful. Full length of unit opens to air conditioned corridor. Carts were smooth and sturdy. Dumpster and recycle dumpster on site for free! I had a time-crunch problem, as well as other situations which made moving almost impossible to contemplate. Ricky presented resolutions to those regarding my delayed move, which allowed me to turn my energy to resolutions elsewhere. His expertise and suggestions were thoughtful and pertinent. I was always confortable calling with urgent questions and Ricky, and Victor both always answered with inifinite patience and useful information I could use. The facility was always very clean, and well-maintained. I recommend Ricky, Victor and this facility with the highest personal regard. First rate facility and staff. The staff are very professional and helpful. It is very easy to recommend this facility. I have been storing my household goods at the Venice, CA facility for two years since I have been traveling around the world quite a bit during this time. I appreciate that the facility is extremely clean and well maintained. When I need to move things around there are always plenty of carts and dollys to borrow. Additionally the staff has been very helpful in answering any questions i have had. A safe place that I trust! The facility is new, has plenty of parking, and is in walking distance from my apartment. Perfect!! This is the third time that I've rented a unit at this storage and I always come back here. It's safe, clean and convinient location. As a renter of this facility for many years I've had positive, easy, and affordable rates that make my life simple. The management has always been top-notch. Sue was the manager for years and once she left I thought that things were going to change, but the new manager, Juan, has kept this place running just like it always has, which is superb! He is super nice and makes my visit to the storage facility pleasant! You should definitely rent from this place. It's clean, easy and there's plenty of parking. I love storing my items here! what a great place! very friendly convenient and excellent service! Pay a bit more but promo helped and we feel secure and clean here. Not your normal storage facility. Our belongings are safe here. Management is more than helpful and efficient. I will recommend this place to anybody - Very clean. Easy paperwork. Superior service. The Best! Juan did a great job walking me through everything. It is stressful moving so it is nice when someone on the other end is friendly and wiling to take care of you. Manager is very helpful. Very nice and clean facility. Good location, and cool inside. Very convenient space, great hours. Nice staff. been here before; good facility. Very nice and very good service. Very helpful and thourough with explanation. I've always had a positive experience here at Extra Space. The staff goes above and beyond to ensure all my requests are accommodated. Big shout out to Juan at the front for all his hard work. I would recommend this place to anyone. Make renting storage a pleasant experience. This place is super clean and very secure. The gate hours, 6 to 10 pm are the best in the area. Been there a few years and completely satisfied and recommend it to everyone. Easy access, convenient location, very clean. Would highly recommend for Venice residents. Go south on Highway 405 to I-10 West. Proceed west and exit Lincoln Boulevard. Make a left so you are heading south. Go approximately 2 miles south to Venice Boulevard. Make a right on Venice Blvd. and Extra Space Storage is located at 658 Venice Boulevard on the left, across the street from Erewhon Market. Take Lincoln Boulevard to Venice Boulevard. Make a left on Venice Blvd. and Extra Space Storage is located at 658 Venice Boulevard on the left, across the street from Erewhon Market. From the 405 take Venice Boulevard west. Proceed west on Venice Blvd. and Extra Space Storage is located at 658 Venice Boulevard on the left, across the street from Erewhon Market. Take Venice Boulevard eastbound and pass Abbot Kinney Boulevard. Extra Space Storage is on the right at 658 Venice Boulevard, across the street from Erewhon Market.